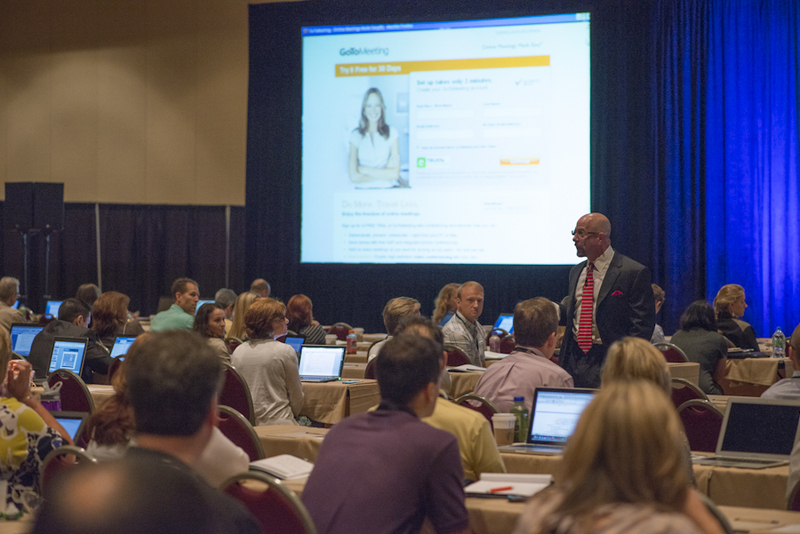 Dr. Flint McGlaughlin, CEO and Managing Director, MECLABS was the opening presenter of B2B Summit 2012 in Orlando. Flint’s presentation, “The Internet as a Living Laboratory,” introduced a case study showing how one B2B marketer used Web experimentation to generate a 90% lift in total leads. In today’s MarketingExperiments blog post, we will take a look at the lessons you can learn from Flint’s presentation, highlighting an experiment that resulted in a 25% decrease in conversion. The MECLABS Research Partner in this study is an event management software firm which lets event coordinators create online registration forms and websites to manage their events. The company’s goal was to increase the number of completed leads on the homepage. The focus of their testing was to determine which page will achieve the greatest addressable lead rate, and they set up an A/B split test to find out. The researchers hypothesized that a focus on the product-specific features and benefits would increase the products appeal. In the treatment they tested headline changes that focused more on the product, included specific features and benefits that express more product value, and ensured the value was communicated in steps. Here is a picture of the control and treatment page, side-by-side. The control beat the socks off the treatment, and resulted in a decrease in conversion of nearly 25%. So, what can you learn from this experiment to help you learn from your own negative results? When the research team asked “why” instead of “how,” they realized that before they could get a lift, they needed a better understanding of the cognitive psychology behind the customer’s motivation. And, to get this understanding, the team decided to use one of the firm’s SEO landing pages, where they could test a smaller subset of visitors that matched the profile of the homepage traffic. Testing on the SEO landing page also provided a testing environment that would not threaten the homepage conversion rate or validity of the results. Here is a screenshot of the SEO landing page control the team used in the second experiment. For Experiment #2’s treatment, the research team took what they had learned about the motivations of visitors to the SEO landing page and changed the focus from the previous treatment’s concentration on product features and benefits to a focus that features the product as a time saver that enabled creating registration forms faster. Flint clarified that by applying key optimization methodologies to the lead capture process, the treatment was able to improve step-level clickthrough rates by 1,312%, and completed leads captured by 548%. When the results of the SEO landing page were applied to the homepage, the treatment generated a 90% increase in leads captured. “Sometimes we need to slow down in order to go fast,” Flint added. He also explained that action is overrated and should be grounded in contemplation, while clarifying that contemplation without action is anemic and cautioning that ultimately action without contemplation is dangerous.